We’d love your help. Let us know what’s wrong with this preview of Thrall by Christie Golden. When Azeroth was young, the noble titans appointed the five great dragonflights to safeguard the budding world. Each of the flights' leaders was imbued with a portion of the titans' vast cosmic powers. Together, these majestic Dragon Aspects committed themselves to thwarting any force that threatened the safety of the WORLD OF WARCRAFT. Over ten thousand years ago, a betra When Azeroth was young, the noble titans appointed the five great dragonflights to safeguard the budding world. Each of the flights' leaders was imbued with a portion of the titans' vast cosmic powers. Together, these majestic Dragon Aspects committed themselves to thwarting any force that threatened the safety of the WORLD OF WARCRAFT. Over ten thousand years ago, a betrayal by the maddened black Dragon Aspect, Deathwing, shattered the strength and unity of the dragonflights. His most recent assault on Azeroth--the Cataclysm--has left the world in turmoil. At the Maelstrom, the center of Azeroth's instability, former Horde warchief Thrall and other accomplished shaman struggle to keep the world from tearing apart in the wake of Deathwing's attack. Yet a battle also rages within Thrall regarding his new life in the shamanic Earthen Ring, hampering his normally unparalleled abilities. Unable to focus on his duties, Thrall undertakes a seemingly menial task from an unexpected source: the mysterious green Dragon Aspect, Ysera. This humble endeavor soon becomes a journey spanning the lands of Azeroth and the timeways of history itself, bringing Thrall into contact with ancient dragonflights. Divided by conflict and mistrust, these dragons have become easy prey to a horrific new weapon unleashed by Deathwing's servants . . . a living nightmare engineered to exterminate Azeroth's winged guardians. When Azeroth was young, the noble titans appointed the five great dragonflights to safeguard the budding world. Each of the flights’ leaders was imbued with a portion of the titans' vast cosmic powers. Together, these majestic Dragon Aspects committed themselves to thwarting any force that threatened the safety of Azeroth. More than 10,000 years ago, a betrayal by the maddened black Dragon Aspect, Deathwing, shattered the strength and unity of the dragonflights. His most recent assault on Azeroth—the Cataclysm—has left the world in turmoil. At the Maelstrom, the center of Azeroth's instability, former Horde warchief Thrall and other accomplished shaman struggle to keep the world from tearing apart in the wake of Deathwing's attack. Yet a battle also rages within Thrall regarding his new life in the shamanic Earthen Ring, hampering his normally unparalleled abilities. Golden is the only author allowed to write in the World of Warcraft franchise, as she has respect for the characters, the Lore, and the fans. In this book, we see why Deathwing is such a threat to all of Azeroth, and why Thrall stepping down as Warchief was a good thing. Thrall has always been one of the best character in the Warcraft universe, and Golden further develops the Orc into his new role as Shaman within the Eathen Ring. Along the way, he exorcises his demons, unites the Dragonflights, Golden is the only author allowed to write in the World of Warcraft franchise, as she has respect for the characters, the Lore, and the fans. Thrall has always been one of the best character in the Warcraft universe, and Golden further develops the Orc into his new role as Shaman within the Eathen Ring. Along the way, he exorcises his demons, unites the Dragonflights, and realizes he loves Aggra, a fellow Shaman. As with every other WOW book, I enjoyed it because I love the world and characters. The writing itself is only OK. Golden's strength is in the characters and their relationships. She creates some very emotional moments in this book, which makes the whole experience worthwhile. Her pacing felt good – I finished the book in a single day so obviously it drew me in. There weren't a lot of surprises, but I was entertained. (view spoiler)[Thrall inevitably becomes the world's savior yet again. It's no As with every other WOW book, I enjoyed it because I love the world and characters. The writing itself is only OK. Golden's strength is in the characters and their relationships. She creates some very emotional moments in this book, which makes the whole experience worthwhile. Her pacing felt good – I finished the book in a single day so obviously it drew me in. There weren't a lot of surprises, but I was entertained. (view spoiler)[Thrall inevitably becomes the world's savior yet again. It's not very believable when so much power is given to a single messiah-like figure, but that's not Golden's fault – it's what Blizzard (ie. Chris Metzen) wants. Christie Golden never fails to impress me. I used to play World of Warcraft religiously and still dabble with the game occasionally but more or less for the story. That is the sole reason I have not cut ties with the World of Warcraft because I love its lore. So whenever I can get my hands on a new book that continues its story I'm all over it. 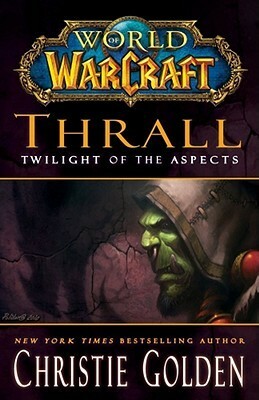 "Thrall: Twilight of the Aspects" is a book worthy of praise and stays true to the fans of the game. I originally thought it would be strange having a dif Christie Golden never fails to impress me. I originally thought it would be strange having a different author write about the Dragon Aspects since Richard A. Knaak has been a pioneer in their character development. I was wrong. The only character I found to be slightly different from the way Knaak originally portrayed her is Ysera - but nothing major. The story itself revolved heavily around the struggles of the dragonflights with, main character, Thrall being at the center of it all. Thrall's great journey of self-discovery and healing was, in my opinion, fantastic! Review originally posted on The Oaken Bookcase on November 20, 2012. This is a World of Warcraft book, so I wrote this review assuming that you have some knowledge of Azeroth and the general timeline of the Cataclysm expansion. If you don’t, this book is probably not for you, but the earlier WoW books may help you to catch up. After the Shattering of Azeroth by the evil dragon Deathwing, the elements are in turmoil. A group of Earthen Ring Shaman, Thrall among them, are at the Maelstrom trying to Review originally posted on The Oaken Bookcase on November 20, 2012. After the Shattering of Azeroth by the evil dragon Deathwing, the elements are in turmoil. A group of Earthen Ring Shaman, Thrall among them, are at the Maelstrom trying to calm the raging elements and prevent the fabric of Azeroth from being ripped apart. Elsewhere, after a horrific attack on the dragons while they are meeting at Wyrmrest Temple, the dragon flights are all but defeated and the Aspects are scattered. Malygos has been slain so the blue dragons are without a leader. Alexstrasza is devastated by the loss of her mate and brood, Ysera the Awakened is still unsure what is reality and what is a dream, and the bronze aspect Nozdormu is missing in the timeways. Ysera requests Thrall’s aid to bring the flights back together and unite them against the Twilight Cult and dragons that are threatening the frozen north and the whole of Azeroth. The timeline of the events in this book as they relate to the Cataclysm expansion itself is not explained all that well in my opinion, but from what I can tell the events take place after Deathwing’s arrival, but before the Bastion of Twilight has been faced. Some of the events that take place are reminiscent of the Hour of Twilight heroic dungeons introduced to the game at the same time as the final battle against Deathwing, but by the end of this book the “Hour of Twilight” has not yet arrived. It doesn’t seem to quite tie in with events as they are in WoW, especially with the Elemental Bonds quest chain involving Thrall and Aggra that was introduced with the Firelands patch. Overall, there is a lot of Lore crammed into this short-ish book. Such an epic tale feels slightly rushed and lacks the detail that could have made this story truly amazing. In addition, I don’t really like Christie Golden’s storytelling style. It’s very grandiose, and while that is fine for the discussion of world-changing events, doesn’t make the characters very relatable. She also uses “Too,” at the start of sentences. I have no idea if that’s grammatically correct or not but it looked all kinds of wrong to my (un-trained) eye! Grammar and continuity quibbles aside, I enjoyed reading about Thrall’s journey around Azeroth in his quest to help the Aspects and, ultimately, to save the world. I loved reading about the characters and places I’ve been visiting in-game for several years. There are also some very emotional events and some exciting battle scenes that really bring the plight of the dragon flights to life. Not a bad story all in all. It's clear that Christie Golden holds the character of Thrall in high regard,and because of this she writes about him well. There were parts early on that helped me learn more about Thrall by answering some questions I had about where he came from and how he became the war-chief of the horde. The cool part is that there are connections to other books that will help answer OTHER questions I have, so there is incentive to read more about that awesome game. I do have a gr Not a bad story all in all. It's clear that Christie Golden holds the character of Thrall in high regard,and because of this she writes about him well. There were parts early on that helped me learn more about Thrall by answering some questions I had about where he came from and how he became the war-chief of the horde. The cool part is that there are connections to other books that will help answer OTHER questions I have, so there is incentive to read more about that awesome game. I do have a gripe that I feel is worthy of mention because, for me, it sort of takes away from being lost in the world that Warcraft has made. The gripe is the reference throughout the book about "Earth", as in earth mother, or "It's no wonder earth is in so much torment." They don't live on the planet earth, people. It's Azeroth....NOT earth. Technically speaking, characters from the game don't KNOW what earth is in the first place! I go into this review with an admission... Thrall is not my favorite Warcraft Universe character. A book centered around him did not strike me as an interesting read, and my first notion was to skip it. But when I learned that in addition to being Thrall-centric it also covered important elements concerning the Dragon Aspects, as well as the ongoing struggles with the Twilight's Hammer, I felt compelled to take it up and give it a thorough read-through. The result: perhaps an understandably mixed I go into this review with an admission... Thrall is not my favorite Warcraft Universe character. A book centered around him did not strike me as an interesting read, and my first notion was to skip it. But when I learned that in addition to being Thrall-centric it also covered important elements concerning the Dragon Aspects, as well as the ongoing struggles with the Twilight's Hammer, I felt compelled to take it up and give it a thorough read-through. The result: perhaps an understandably mixed bag. Golden is in her element painting the subtleties of interactions between characters, and I found her handling of Thrall and Aggra's relationship to be quite good, something I've definitely not felt from other sources. Her depictions of dragons, and the Dragon Aspects themselves, was also very interesting... and it's always cool to see Nozdormu depicted, as he gets so very little presence otherwise. Reader Note: I have played World of Warcraft for six and a half out of the eight years the game has been running. The big thing I have loved about the game is the lore and that’s why I go out of my way to read all the books published in this series. I play strictly on the side of the Horde and so I have a definite dislike of the Alliance, but I try to look at the books with a nonjudgmental view in regards to the two factions though my reviews may mention a dislike of this certain character or fa Reader Note: I have played World of Warcraft for six and a half out of the eight years the game has been running. The big thing I have loved about the game is the lore and that’s why I go out of my way to read all the books published in this series. I play strictly on the side of the Horde and so I have a definite dislike of the Alliance, but I try to look at the books with a nonjudgmental view in regards to the two factions though my reviews may mention a dislike of this certain character or faction from time to time. I do try to not let my dislike of the Alliance from affecting the rating and review of the books as much as I can. I had been so excited when I found this book back when it first came out. Thrall has always been one of my favorite Horde leaders, with Lady Sylvanas and Cairne Bloodhoof being the other two I absolutely loved. So to find another book that focused on this character was a great thing. Not to mention the fact that it was written by Christie Golden, who also wrote Arthas: Rise of the Lich King and The Shattering: Prelude to Cataclysm, both books I fully enjoyed and have read more than a few times. Sadly though my excitement was quite quickly dashed with this. Thrall was a weak character right from the start. Sure he is no longer Warchief of the Horde, something a lot of people agree on as being a bad decision, especially since it meant Garrosh Hellscream now leaders the faction, but I didn’t expect his character to be so broken. This was not the Thrall I have come to love over the years and it disappointed me completely. But I told myself that it would get better, for surely his character would rise to the occasion and show himself to once again be the strong Orc everyone knows his to be. In a way he did, but even so it just didn’t feel right. Now the book wasn’t all terrible. There were a few portions of it that I did enjoy, however they were so minimal compared to everything else that I didn’t feel they made up for the overall bad feeling the rest of the book gave me. I think the big issue for me, outside of Thrall character seeming so weak, constantly second guessing himself, seeming lost no matter what he did, was that he also was the solution to everything. That just seemed like poor writing to me. I get it, it was trying to show how ever though his role within the world had changed and perhaps even lessened in a way, lets face it going from the Warchief of an entire faction to a simple shaman is a huge change (even if his role among the shaman was important), that he is still important to the world even if he himself doesn’t realize it at first. Though I had hoped that he would grow into something more like the character I have known him as in the past I was fairly disappointed with the end result. Now I will admit, that I wasn’t one hundred percent up to date with all the lore in the game since I had quit the game for a year and a half so several aspects of the lore were unknown to me, something felt very off about the lore inside this book. I don’t know if it was the writing style or just the rest of the book affecting my opinion but I did not enjoy it like I should have. Just as I was unimpressed by the writing in The Shattering: Prelude to Cataclysm, I continue to find Golden's writing juvenile and, in many places, just plain bad. I fail to understand why so many fans prefer her WarCraft novels over Knaak, and it pains me to know that authors are becoming "New York Times Bestsellers" on the skirt tails of media tie-ins. The characters seemed to lack the depth I know they have, and I felt as though Thrall's dialogue was out of character many times. I also think that Thrall: Twilight of the Aspects fit awkwardly into the timing already in place within the game. We know it must happen before Patch 4.2 because of the appearance of (view spoiler)[Nozdormu (hide spoiler)] at Nordrassil with Alexstrasza, Ysera and (view spoiler)[Kalecgos, the new Aspect of Magic (hide spoiler)]. But it seems as though some events have happened in both the novel and the patch 4.2 content, more thoughts between the spoiler tags. (view spoiler)[At the beginning of Thrall, he is struggling to perform his duties as a shaman, he is distracted and unable to concentrate. He is called by Ysera to go on his journey to unite the dragon flights, which he achieves by performing a ritual including himself as a stand in for the Earthwarder. I imagine this is how he got the titles Earthbinder and World Shaman, because of the extra power he has now that he is united with the dragons. How is he so shattered after this journey that he is able to revisit all of those emotions in the Elemental Bonds chain? When he says that he is Go'el, no longer thrall to the Horde, he is accepting that it was the right thing for him to do to step down from his position as Warchief, why then does his self-doubt about this appear in the Vortex Pinnacle? Thrall discovered his "heart" and desire for Aggra in the novel and expression that love is, in part, what made him able to bring Alexstrasza back to the flights. He also comes to terms with the death of his parents, the death of Cairne and releases his rage toward Blackmoore throughout the course of the novel. Why then does his rage burn so hot on the Firelands? Thrall also asks Aggra to be his lifemate at the end of the novel as well as at the end of the Elemental Bonds quest chain in Patch 4.2. This review has been hidden because it contains spoilers. To view it, click here. I think the only reason I wound up enjoying the book as little as I did was because I enjoy playing World of Warcraft so much. I knew about most of the locations that were in the book (particularly Wyrmrest Temple), so it was kind of fun to see it through the eyes of some of the major NPCs of Azeroth. The book started out fairly interesting despite some weak writing in parts, and I enjoyed the slow set-up of some of the antagonists. Then, about half-way through the book it became stale and the an I think the only reason I wound up enjoying the book as little as I did was because I enjoy playing World of Warcraft so much. I knew about most of the locations that were in the book (particularly Wyrmrest Temple), so it was kind of fun to see it through the eyes of some of the major NPCs of Azeroth. The book started out fairly interesting despite some weak writing in parts, and I enjoyed the slow set-up of some of the antagonists. Then, about half-way through the book it became stale and the antagonists started behaving like children's cartoon villains. Arygos was especially disappointing after his initial introduction and interaction with Alexstrasza and Kalecgos. He seemed a competent, capable villain who turned into such a simpering wimp the moment he was in the same room as the Twilight Father who I've been told he's been around for months. Why would a dragon who is strongly of the belief that the mortal races of Azeroth are so much dirt under his feet be bowing low to a human? At least Chromatus recognized the Twilight Father was not the true leader, that it's Deathwing he and everyone else should really fear. Speaking of the Twilight Father, he too suffers from at first appearing frightening and a definite threat to being, well, I can't believe we're scared of the Twilight Hammer in this book at all. If I hadn't been playing the game and know how vast their reach is (to the extent there's been hints they're in some pretty lofty positions of power within both the Horde and Alliance), I'd be unable to even remotely believe there was any necessity for Thrall's help at all. As it stands, Thrall winds up becoming a Gary Stu, which I suppose you can't really help in this case because he is the former Warchief of the Horde, and an awesome one at that. Still, it was hard for me to swallow the four remaining Aspects (the blues receive a new Aspect) nearly bowing down to the orc as much as they did. I get it, they're the good guys, but they're also Aspects and a little snootiness might not be out of place. This review has been hidden because it contains spoilers. To view it, click here. As happens with Golden, I tore through this in a day. Where Knaak tends to drag on a bit too long for my taste Golden keeps excellent pace and I had a hard time putting this book down rather than picking it up. One thing I do like best from Knaak's novels though is Korialstrasz. And the way his death is handled in this book is a major, major problem for me. As much as I liked the book, thinking about Krasus has spoiled the story so much that I almost wish I hadn't read it, or had read it knowing As happens with Golden, I tore through this in a day. Where Knaak tends to drag on a bit too long for my taste Golden keeps excellent pace and I had a hard time putting this book down rather than picking it up. One thing I do like best from Knaak's novels though is Korialstrasz. And the way his death is handled in this book is a major, major problem for me. As much as I liked the book, thinking about Krasus has spoiled the story so much that I almost wish I hadn't read it, or had read it knowing the end. Disclaimers: 1) Krasus/Korialstrasz is my favorite character. 2) I don't like character deaths unless absolutely, undoubtedly, incredibly necessary. However of all deaths, Krasus's is one of the most heartbreaking/important and, in my opinion…it's sort of glazed over. I'm probably just stupid but after the explosion, when Kiry kind of smirks I thought that Krasus must still somehow be alive. I spent the book waiting for him to make a heroic return but 300 pages later found out, 'no, it was real, but here's why he wasn't a traitor' when, in my opinion, that was the only clear thing about it. And although we eventually see what Krasus had to go through in his final moments, I didn't really get a chance to mourn him. The double-edged sword of Golden's lightning-fast pace, I suppose. I know it was Thrall's book and Knaak is more one to focus on Krasus, but Krasus has been around for enough books amd done so much that he actually deserved the kind of reflection Knaak tends to pile on in his books. Like I said, I'm incredibly biased, but I feel Krasus deserved much more of a send off then he got in this book—especially considering the depth of the sacrifice he made. Christie Golden is an extremely talented fantasy author. In this installment of World of Warcraft supplements, we are on the journey of one of Azeroth's most iconic characters, Thrall. As a character that is rich in lore, this book was an integral part of the Cataclysm and the events that followed her book, The Shattering. Unlike so many of her other books, I found that this was incredibly slow paced and wasn't as gripping as I know that it could have been. This was due in part because of the st Christie Golden is an extremely talented fantasy author. In this installment of World of Warcraft supplements, we are on the journey of one of Azeroth's most iconic characters, Thrall. As a character that is rich in lore, this book was an integral part of the Cataclysm and the events that followed her book, The Shattering. Unlike so many of her other books, I found that this was incredibly slow paced and wasn't as gripping as I know that it could have been. This was due in part because of the style that was necessary to convey a more immersive story but it wasn't well executed. In this book Thrall is sent on a journey by Dragon 1. That journey leads him to Dragon 2 where he explains what Dragon 1 said. This then sends him on the task to meet Dragon 3 where he recounts his encounters with Dragons 1 and 2; this continues until he is repeating the same story over and over. As I mentioned, it is believable to understand that he would be compelled to explain this but it isn't something that, as a reader, I needed to read that many times. The condensed versions of the story could seemingly erase a good 20% of the storytelling done and I would have been okay with that because I still would have had all the necessary information. Christie Golden succeeds once again in bringing the world of Azeroth to life in her novelisation of the Hour of Twilight arc in the World of Warcraft lore. This story focuses on the difficult chapter in the history of the Dragon Aspects and their ultimate battle with one of Deathwing's most despicable abominations, the five-headed dragon Chromatus, created solely to destroy the remaining Aspects and bring about the order of the unnatural Twilight Dragons. The story begins just after the prelude to Christie Golden succeeds once again in bringing the world of Azeroth to life in her novelisation of the Hour of Twilight arc in the World of Warcraft lore. The story begins just after the prelude to the shattering of Azeroth but before the Cataclysm game expansion and fills in the little plot holes in the lore that wasn't fully explored in the game, such as the creation of Chromatus and how the blue magic flight once again gained a new Aspect to lead them. We learn the importance of certain characters' intervention in this arc and details that were briefly touched upon in game are fully fleshed out here, lending it a more emotional viewpoint that made it a tear-worthy read. I did find that the author took some creative liberties and added new events to the story that were never mentioned in the game but this extra story does not interfere with the existing lore in any way and, in my opinion, gave the characters a more powerful connection to each other. Christie Golden certainly knows how to breathe life and personality into already established characters without making them act too differently from their in game counterparts. Christie Golden proves again her mastery of solid Warcraft storytelling. While the novel is short and sparse, it feels good to once again wander across the face of Azeroth with Thrall, former warchief of the Horde and now a shaman seeking to heal the world's wounds suffered during the Cataclysm. I cannot recommend this novel to anyone unfamiliar with Warcraft lore. Where one of Thrall's previous headlining novels, Lord of the Clans, could be enjoyed by anyone not familiar with Warcraft, this nov Christie Golden proves again her mastery of solid Warcraft storytelling. While the novel is short and sparse, it feels good to once again wander across the face of Azeroth with Thrall, former warchief of the Horde and now a shaman seeking to heal the world's wounds suffered during the Cataclysm. I cannot recommend this novel to anyone unfamiliar with Warcraft lore. Where one of Thrall's previous headlining novels, Lord of the Clans, could be enjoyed by anyone not familiar with Warcraft, this novel is too intertwined with events and situations beyond the story's trappings. Loose ends in the novel wrap up in the game, but no promise is given to that here in the story. If the novel has any other shortcomings, it is that it is quite sparse and direct with its storytelling and details, never dwelling on anything and staying on them long enough to tell the story and go on. Events speak for themselves, more or less, and it is to the novel's credit that nothing feels labored. The only lapses are in the action scenes, whereby some lack the sense of purpose found in many other sections of the novel. Apart from this, one could do worse than spending a day or so in Thrall's shoes. While Thrall may be a bit of a Gary Stu at times, he's one that I never tire reading about. I didn't enjoy this book as much as Golden's other WoW novels. To start with, it left me with more questions than answers - for instance, how did a certain human and one of the best blue dragons in the game suddenly turn to the Dark Side Twilight's Hammer and why do they want to watch the world burn? When did Thrall regress from the reasonable, level-headed guy who's always keen to hear everyone out to teenage-grade angst and moodiness? (I get that the author wanted a greater contrast between page 10 Thrall and page 400 Thrall Go'el, but still). What happened to alternate-timeline you-know-who? (While I do appreciate the fanservice, the concept that there's only one 'true' timeline and all the other ones are collapsing was random and didn't make much sense). How did the moons know who to appoint as the next Aspect? Was there some sort of telepathic connection with the Blues? And so on. Thrall could not concentrate on his task beside his shaman friends in Maelstrom, so accepted Ysera's offer to find Nozdormu, the timeless Bronze dragon, and then tried to calm down alexstrasza, the life binder after loss of Kerasus, assuming his betrayal, and also help Blue dragons to replace their aspect (Malygos died in battle with other dragons, because he went crazy and decided to kill all alive being) and finally unite all dragon-flights against the twilight dragons and win the war. He manag Thrall could not concentrate on his task beside his shaman friends in Maelstrom, so accepted Ysera's offer to find Nozdormu, the timeless Bronze dragon, and then tried to calm down alexstrasza, the life binder after loss of Kerasus, assuming his betrayal, and also help Blue dragons to replace their aspect (Malygos died in battle with other dragons, because he went crazy and decided to kill all alive being) and finally unite all dragon-flights against the twilight dragons and win the war. He managed all those things and filled the place of Death-wing in the battle as the guardian of the earth and became an aspect. It was odd that he could give alexstrasza a vision that the timeless ones could not, to tell him that Kerasus did not betray them, in fact, he sacrificed himself. Anyway, it seems that Ysera could see the role of Stormrage in fighting against nightmares and also the role of Thrall in fighting against Twilight dragon. Thrall took the name his parent had given him, Go'el and stopped being Thrall of the horde and gained his freedom. 2. Keep in mind there are very few well-written time travel books. 3. If you are a successful writer and you have some doubts that you won't be able to write a time travel novel - don't do it. 4. If you are a successful writer, a time travel book could be a certain way to fail. 5. It would be better not to do time travel at all. Sometimes I wonder how these World of Warcraft books would hold up if I wasn't already so invested in the lore due to playing the game so much. The story is a bit contrived at times, but that's easy to overlook when you enjoy learning more about what is going on in the world where your game character lives. It's no secret that Chris Metzen is in love with Thrall, and this entire expansion is basically "Thrall's Time to Shine"... so of course he's going to be very prominent in the books dealing wi Sometimes I wonder how these World of Warcraft books would hold up if I wasn't already so invested in the lore due to playing the game so much. The story is a bit contrived at times, but that's easy to overlook when you enjoy learning more about what is going on in the world where your game character lives. I can't point to anything here I *didn't* like, and there was much that was good: Thrall's journey from Warchief to shaman, several of the dragon characters. But it didn't grip me the way her previous WoW novels have, and I can't really say why. The Story: When Azeroth was young, the noble titans appointed the five great dragonflights to safeguard the budding world. Each of the flights' leaders was imbued with a portion of the titans' vast cosmic powers. Together, Bookworm Speaks! The Story: When Azeroth was young, the noble titans appointed the five great dragonflights to safeguard the budding world. Each of the flights' leaders was imbued with a portion of the titans' vast cosmic powers. Together, these majestic Dragon Aspects committed themselves to thwarting any force that threatened the safety of the WORLD OF WARCRAFT. The Review: If Bookworm had to choose, then Bookworm would say that the orc Thrall is probably their favorite character in all of World of Warcraft. For a long time now, there were persistent rumors that Thrall would end up in romantic relationship with the human character Jaina Proudmoore, with whom they shared a close friendship for many years and was partially responsible for maintaining piece between the Horde and the Alliance. Thusly the ‘shipping’ between Thrall and Jaina lasted quite a while and was vocal component of the fandom. One that Blizzard did much care for and thusly crafted a character in order to silence the shippers and set the record straight, hence: The Orc Shaman Aggralan. The developers pretty much admitted that was their intent and shows in regards to the character. Aggra is not the most interesting character. Bookworm actually had to consult the World of Warcraft Wiki because they could not even remember her name! Perhaps future expansions, both in the games as well as the bookshelves will develop her character. If Aggra has any hope of being as memorable as her husband, it will be a necessity. Bookworm was rather neutral in regards to the prospect of romance between Thrall and Jaina but Blizzard would have done well to settle it one way or another, without creating such a token and forgettable character. Thankfully, Aggra is not in this book for very long and spares the reader her blandness. Tremendous strides have been made in regards to representation of female characters over the dominant male characters but Aggra needs some serious writerly love. Emotionally charged and penetrating, Twilight of the Aspects continues Thrall's adventures during the events of Cataclysm and follows him on an intense journey that provides an incredible perspective and some important world lessons in the form of a compelling story. Having read Twilight of the Aspects years ago, I immediately dismissed it as just a fun adventure that Thrall goes on. My re-read has actually delighted me more than I thought it would. While I can understand why some Warcraft fans t Emotionally charged and penetrating, Twilight of the Aspects continues Thrall's adventures during the events of Cataclysm and follows him on an intense journey that provides an incredible perspective and some important world lessons in the form of a compelling story. Having read Twilight of the Aspects years ago, I immediately dismissed it as just a fun adventure that Thrall goes on. My re-read has actually delighted me more than I thought it would. While I can understand why some Warcraft fans tired of Thrall and his importance to the story, with the more passionate among them calling him a Mary Sue, I have to disagree with their opinions. Thrall is marred with mental and psychological hardship; he has suffered the loss of so many dear friends, assumed the mantle of leadership without necessarily wanting it and had to make many sacrifices for the good of the Horde. Twilight of the Aspects continues what The Shattering began: it tells us the story of how Thrall is learning to not only deal with his experiences but to heal from them and to use them to become a better person. When tasked with a seemingly simple task from an entirely unexpected source, Thrall embarks on a quest that teaches him such simple yet utterly intrinsic lessons: to live in the moment, that one must follow the heart and that humility is as important in a person as strength. This was absolutely amazing - and though I love all the Warcraft books written by anyone - Golden is simply superb. To give you some plot: Thrall, former warchief of the Horde, now shaman of the Earthen Ring, is given a personal quest, by none other than Ysera, Aspect of the green dragonflight. Thrall must leave the Earthen Ring and his duties to heal Azeroth to go find Nozdormu, Lord of the Bronze dragons and Aspect of the bronze dragonflight, who's gone missing. But Nozdormu isn't missing just This was absolutely amazing - and though I love all the Warcraft books written by anyone - Golden is simply superb. To give you some plot: Thrall, former warchief of the Horde, now shaman of the Earthen Ring, is given a personal quest, by none other than Ysera, Aspect of the green dragonflight. Thrall must leave the Earthen Ring and his duties to heal Azeroth to go find Nozdormu, Lord of the Bronze dragons and Aspect of the bronze dragonflight, who's gone missing. But Nozdormu isn't missing just anywhere - being the Timeless One and guardian of the timeways - he is of course missing in time. With the help of first the green dragons, then the bronze dragons, Thrall ventures into the timeways, looking for Nozdormu and along the way he comes face to face not just with own past, but his past friend's futures as well as horrible alternate realities. The conclusion of this quest accumulates in the clashing of new Aspects, Deathwing, The Twilight Father, abominable twilight dragons, and a horrid revelation of the interconnectedness of all of it and the evil forces behind it. To sum up, this is an amazing story with Thrall at the center, learning about his life from infant to warchief to shaman, while the whole of Azeroth is on the brink of destruction. I'll say it again, I love Christie Golden, her writing is just superb - and to have her write a big background story like this on Thrall, where we explore the past, the future, alternate timeways is just my every dream come true. Thrall is such a loveable character, a strong and deadly warrior at one end of the spectrum, but a caring, loving thinker at the other. Is arc is incredible to follow, and he's had such an impact in this world that I've loved for the last 20 years, that every story about him is a gift for me. To all the fans of World of Warcraft, you will not be disappointed. The story of one of Azeroth's most beloved characters Go'el son of Durotan and Draka, continues in this extract from the Cataclysm series of events (WoW fans would be familiar). The story follows Shaman and ex-Warchief of the Horde, Go'el aka Thrall on his journey to discovering an inner peace he so desperately needs in order to heal a world fractured by the Cataclysm brought upon by Drathwing, the Dragon Warden of Earth, one of To all the fans of World of Warcraft, you will not be disappointed. The story of one of Azeroth's most beloved characters Go'el son of Durotan and Draka, continues in this extract from the Cataclysm series of events (WoW fans would be familiar). The story follows Shaman and ex-Warchief of the Horde, Go'el aka Thrall on his journey to discovering an inner peace he so desperately needs in order to heal a world fractured by the Cataclysm brought upon by Drathwing, the Dragon Warden of Earth, one of five Dragon Aspects called upon by Azeroth's Titans to protect the world. While I won't be spoiling the details surrounding the story itself, the events surrounding "Twilight of the Aspects" have an unusual balance between sped up events to a point where you might have to go back a few pages or chapters to remember, and slow paced thoughts of Thrall. The interaction between the characters is lovely, hearty and placed into the the moment although sometimes overplayed with the cheesiness. Two major issues that arise while reading this book is (1) Thrall is too much of a goodie two shoes for my taste; no one could be that "perfect" (2) the magic and description of the mythos involved in the story was a bit weak in my opinion. What I liked about the writing though is that the locations and sensations felt by the characters hit where it stung. Visualization was not a problem in this book. Simple tale of heroic fantasy. The world of Azeroth is crumbling. The orc shaman Thrall undertakes a quest given to him by Ysera, the green dragon aspect. The quest takes him on a journey to save the world and also himself. The hero worship is over done. Thrall can do no wrong. Even worse, the solutions to every problem are almost nothing to do with Thrall himself. One exception is when Thrall is being a basic psychologist to ancient beings of great power. The simpleness of the advice and resolut Simple tale of heroic fantasy. The world of Azeroth is crumbling. The orc shaman Thrall undertakes a quest given to him by Ysera, the green dragon aspect. The quest takes him on a journey to save the world and also himself. The hero worship is over done. Thrall can do no wrong. Even worse, the solutions to every problem are almost nothing to do with Thrall himself. One exception is when Thrall is being a basic psychologist to ancient beings of great power. The simpleness of the advice and resolutions is ridiculous. The descriptions of the environments are lacking. There is an expectation that the reader knows what different locations look like. My own memory of the computer game is hazy. I had to search on the internet to see what the novel was referring to. There is a lot of pre-existing lore to the Warcraft world but I understand most of it needs to be assumed. This review has been hidden because it contains spoilers. To view it, click here. I didn't have a chance to review this book when I finished it because my OS had been shot and I was waiting on the discs to repair it. But it was EXCELLENT!!! A note of disclaimer: I usually don't read a lot of series genre fiction. Call it a personal thing or whatever, I just didn't. I guess I didn't really think they'd be good. Kinda fluffy and whatever. So that's my bias going in. Afterwards, I have to admit a bunch of shame at this original thought. And I'm more open to reading series genre f I didn't have a chance to review this book when I finished it because my OS had been shot and I was waiting on the discs to repair it. But it was EXCELLENT!!! A note of disclaimer: I usually don't read a lot of series genre fiction. Call it a personal thing or whatever, I just didn't. I guess I didn't really think they'd be good. Kinda fluffy and whatever. So that's my bias going in. Afterwards, I have to admit a bunch of shame at this original thought. And I'm more open to reading series genre fiction as a result. For example, yesterday, I went to my local library to see what other WoW books they had. I picked up the only other one and put holds on two more. I'm glad I gave this a chance because I now have a new group of books to tear into. I play WoW, which makes sense since I chose this book. And I'm horde side (Lok'tar Ogar!). So I wanted to read a book about a figure who would be more meaningful to me. I've loved Thrall for years as this wise and gentle shaman who worked with the Alliance as well as to restore order to the Horde. But I didn't know as much about the lore as I'd liked to have. I picked this up and started our adventure. From the first few paragraphs, the story gripped me. In fact, the whole book was like that, making it really impossible to put down (and barring sleep and basic chores, I didn't until it was finished). Finding Thrall in the midst of a ritual at the Maelstrom really thrust me into the heart of the action. And then, so close to a moment of failure, when Thrall couldn't concentrate and felt the weight of the world on his shoulders, it made me immediately sympathetic. There! I was snared. Now here's the awesome thing about it being WoW genre fic: I knew all of the characters. Knew and loved or loathed them. I've done quests aiding them and fighting against some of them. Everything was familiar because I've played with these characters, off and on, for the last 10 years. And I think that's the thing I really loved about it. It felt like I was playing a quest chain in the Cavern of Time (even mentioned in the book so that was really cool), where I went back as spectator to a key time in Thrall's life. It effortlessly weaved it's way between gameplay and lore and I really appreciated that. Plus, it made the introduction of new characters that much more engaging because the arrival of a new one always caused me to gasp, saying, "Oh YEAH!!! I remember THAT dragon!!" or something similar. Speaking of the dragons, getting to empathize with the dragons as having personalities and agency was really wonderful. I ride around on my twilight drake in game, the one you get after beating Malygos, and I never fully appreciated what that meant until this book. The pain you felt between the various Aspects, like when Alexstrazsa (sp?) lost her love and her eggs, felt like legitimate anguish. The despair rising within her, when her mind vascilated between madness and suicidal tendencies, was palpable as she flew through Desolace to her lonely perch. The struggle over ownership within the Blue Dragonflight. The loss and confusion of the bronze dragonflight at the disappearance of Nozdormu. Like, these were all well-detailed and well-written. And now I have a new appreciation for these creatures that I see every day in game without thought to what it meant to be a dragon or an Aspect. Thrall coming into his own through helping the dragons find their way back to each other was a nice touch. Sometimes, I find it easier to sort through my own life while assisting others with their tasks and that made this really relatable. Plus, I am a softie and a romantic, so the idea that Thrall was able to at least see a glimmer named Aggra who made him pull it together was heartening. The idea that, no matter what his role was to be in uniting the Aspects, that it was his desire to see Aggra again that propelled him further. Sappy but it hit the spot. Thrall's journey within the Caverns of Time was also amazing. I remember the first time I ran a Caverns of Time dungeon. The one I recall was Thrall's rescue from Durnholde Keep. Getting to not only witness, but take part in, one of the most important parts of Horde lore was enthralling. I felt similarly here, as Thrall traveled the pathways in his past. My heart broke when he realized he was about to witness the death of his parents *but could not interfere*. The helplessness this one-time warchief felt at being broken into inefficacy generated similar feelings in me as I read it. There was a tightening in my chest as I wished I could console him. Which is funny in and of itself considering he's a character in a book. But that's the hallmark of good writing, to be sure. When you forget that you're spectating and are lulled into believing you're interacting. His interaction with Taretha of a different timeline felt similar. His relief at knowing her, seeing her again....his sadness in knowing how different this version had to become to survive her own timeline, and even his eventual need to make peace with knowing his righting the timelines would erase this Taretha completely--all were brilliantly conveyed while maintaining good pace and engaging dialogue. Meanwhile, Arygos vs the Twilight Father scenes were neat too. Deathwing's treachery knows no bounds. No wonder his head is displayed in Orgrimmar.